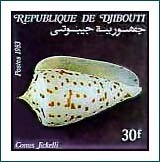 Djibouti is a tiny, impoverished republic just north of the Horn of Africa on the strait of Bab el-Mandeb. Bordered by Ethiopia, Somalia, and the newly independent nation of Eritrea, Djibouti has been adversely affected by regional tensions. The sky above and the land below are reflected in the blue and green stripes of this flag, first flown in 1967. The white triangle is for peace and equality. Unity is symbolized by the red star. Nearly 90% of Djibouti is volcanic desert. Minor mountain ranges extend from the coastal plain to the Ethiopian highlands, where Moussa Ali, the highest point in the country, rises to 2,063 m (6,768 ft). The coastline is deeply indented by the Gulf of Tadjoura. Djibouti is one of the hottest places on Earth, with an average annual temperature of nearly 32° C (90° F). The average annual rainfall is less than 125 mm (5 in), and vegetation is sparse. 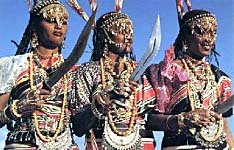 The population is roughly divided between two groups: the Afars of the north and the Somali-speaking Issas of the south. Both are Muslim, and both were traditionally pastoral nomads. The Afars, who lean politically toward Ethiopia, and the Issas, with traditional affinity to Somalia, have often fought fiercely. Djibouti has suffered economically from an influx of refugees from Ethiopia and Somalia. The country also has an Arab trading community and a substantial French presence. Educational and health facilities are limited. The city of Djibouti, the capital and only urban center, is also the terminus of the Djibouti-Ethiopian Railroad (completed 1917 but now badly in need of repair). Its port provides much of the national revenue, and the service sector is being expanded. Port revenues increased in 1998, when Djibouti became the main port for Ethiopia's imports and exports due to conflict between Ethiopia and Eritrea. Less than 10% of the land is permanent pastureland where nomads graze cattle, sheep, and goats. Date palms are grown on the small amount of irrigated land. There is some fishing. Salt extracted from the sea is the major resource. Almost all consumer goods are imported, and the economy is dependent on foreign aid. In 1999�2000 a severe drought dried up water holes and pastures, and an estimated 100,000 people required emergency food aid from international donors. France took possession of Djibouti (called French Somalia) in 1884. As the Territory of the Afars and the Issas, it remained part of the French republic until 1977, when it gained independence despite conflicting Ethiopian and Somali claims. It later tried to remain neutral in conflicts between and within Ethiopia and Somalia. In 1981, Djibouti officially became a one-party state headed by a directly elected president. Hassan Gouled Aptidon, Djibouti's first president, was reelected in 1981 and 1987. The country was the base of French operations during the 1991 Persian Gulf War. An Afar-based armed rebellion in the north that began in late 1991 soon gained control of much of the country. In 1992, Aptidon introduced a multiparty constitution that was approved by voters in September. In 1993 he won a fourth term in Djibouti's first multiparty presidential election, but the election was boycotted by much of the opposition, and civil strife continued. In December 1997, three years after the signing of a peace settlement that ended the civil war and granted ethnic Afar rebels representation in the government, Aptidon's party won every seat in national legislative elections. In 1999 he announced that he would not run for reelection due to ill health. Aptidon's chief of staff, Ismael Omar Guelleh, won nearly 75% of the vote in the April 1999 presidential elections as the joint candidate of the ruling Popular Rally for Progress and the Front for the Restoration of Unity and Democracy (FRUD). A second peace accord between the government and the radical wing of FRUD, which had continued its antigovernment struggle, was signed in February 2000. Bibliography: A. Fozzard, Djibouti (1993); R. Tholomier, Djibouti, trans. by V. M. Thompson and R. Adloff (1981). Images: Flag of Djibouti, courtesy of Mapquest.com, Inc. ; 10,000 Franc note (obverse & reverse), from ATS Notes - World Paper Money Galley ; Djiboutian Musim ladies in native costume, courtesy of Lulseged Ayalew ; 30-Franc Djibouti postage stamp, courtesy of Dr. Bruce Livett at the University of Melbourne (web site: Cone Shells & Conotoxins). Total Area 8,494.25 sq. mi. Is this a good time to call someone in Djibouti? Find out by checking the correct local time in the capital. The Federal Consumer Information Center offers information on passport and visa requirements for Djibouti. The non-profit, human-compiled database provides useful links about Djibouti, in both English and French.